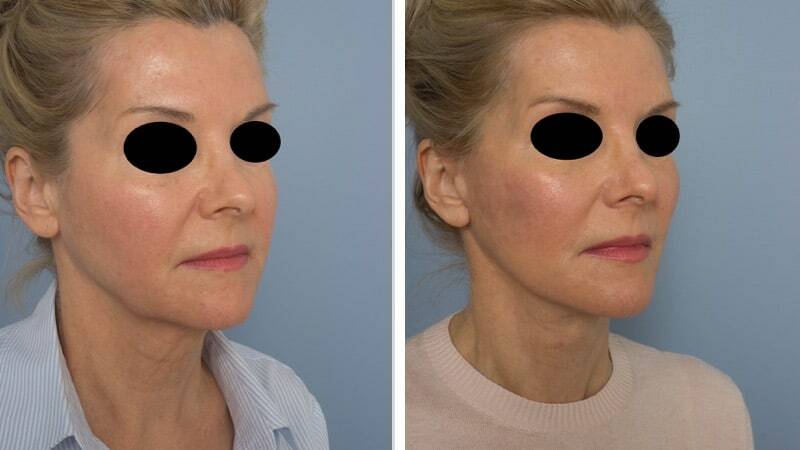 Eyelid surgery is called blepharoplasty. It is usually performed for people with excess eyelid skin or fatty bags around the eyes, or to reduce the signs of ageing. 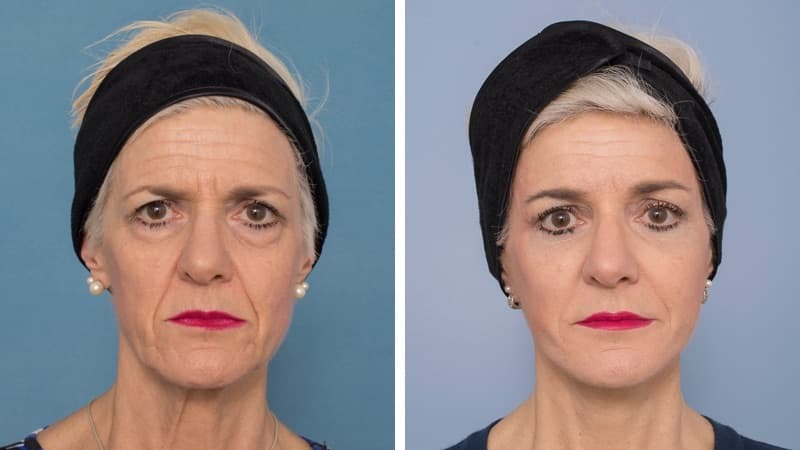 Blepharoplasty effectively reduces bags above or below the eyes, and removes loose or excess skin around the eyes, giving a younger and fresher appearance. Blepharoplasty will not remove dark pigmentation under the eyes, nor will it completely eliminate lines such as ‘crow’s feet’. 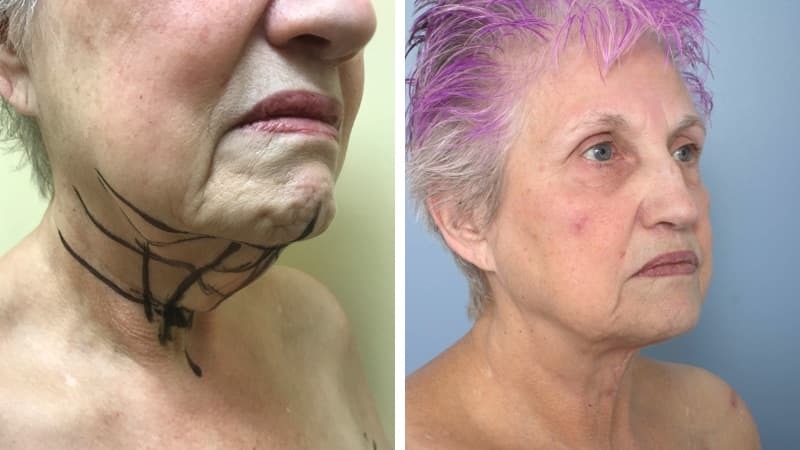 If you have fine wrinkles around the eyes, I may recommend laser resurfacing during surgery to smooth them, with the possible addition of wrinkle reduction injections. During consultation I assess the position of the eyebrow carefully as this affects the position of the upper lid. 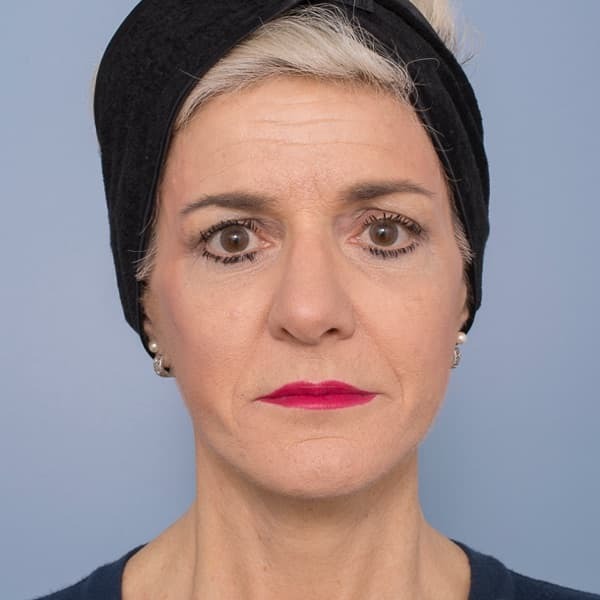 Sometimes, descending or drooping brows are actually part – or all – of the problem, and they need to be addressed at the same time as the excess eyelid skin. For both upper and lower lid, careful assessment and a thorough consultation are essential before making an operative plan. When assessing the lower lid, the tear trough and the cheek are also considered. The lower lid, tear trough (line between the lid and cheek) and the cheek are interdependent, so they must be assessed together. You should avoid aspirin or related compounds, which interfere with normal blood clotting in the two weeks before surgery. You should wash your face thoroughly the night before surgery and again on the morning of surgery. Do not apply any facial creams, lotions or make-up before attending the hospital or clinic for surgery. For blepharoplasty we will use either a general anaesthetic, or heavy sedation and local anaesthetic. The operation takes between one and three hours. There is no pain during the procedure and you will have minimal or no recall. After the surgery there will be fine scars in skin creases. These are usually not noticeable when completely healed. 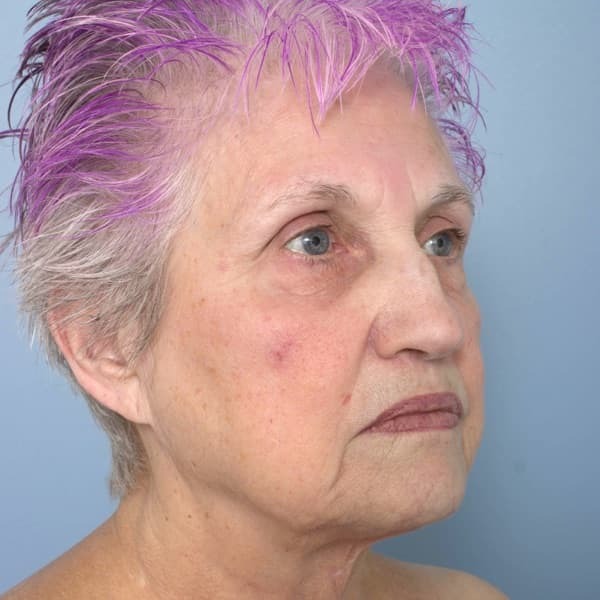 Occasionally patients notice a small loss of skin sensation over the lids. This is of no consequence. A period of eye irritation or discomfort is common after blepharoplasty as surgery can cause inflammation in the tissues. Ointments and drops may be needed for some days or weeks until this settles down. Medication is given to limit any pain and nausea. You are usually able to return home on the day of surgery. Your vision will be blurry, due to ointments, so you may prefer to stay overnight in hospital. 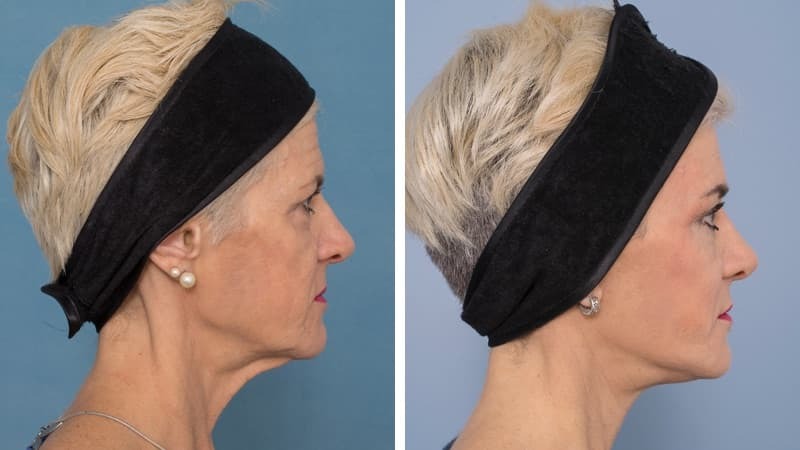 At home you must set yourself up in a comfortable chair, on a couch or in bed, with your head elevated for two or three days following surgery. This limits the swelling and discomfort, as does resting for the first week. We encourage walking and plenty of gentle movement but avoid straining where possible. Normal showering after surgery is fine. Bruising is usually present for seven to fourteen days and it takes one to three months for all the swelling to resolve. We recommend two weeks off work, and if you have an important social or public event coming up, try to allow six weeks to recover fully. You may resume driving once you are comfortable, can react quickly if necessary, are not taking strong painkillers and can see normally. This usually takes between five and seven days. Possible complications of blepharoplasty include infection, bleeding, asymmetry, eye discomfort, ectropion (pulling down of the lower lid), eye injury, scar or wound problems. 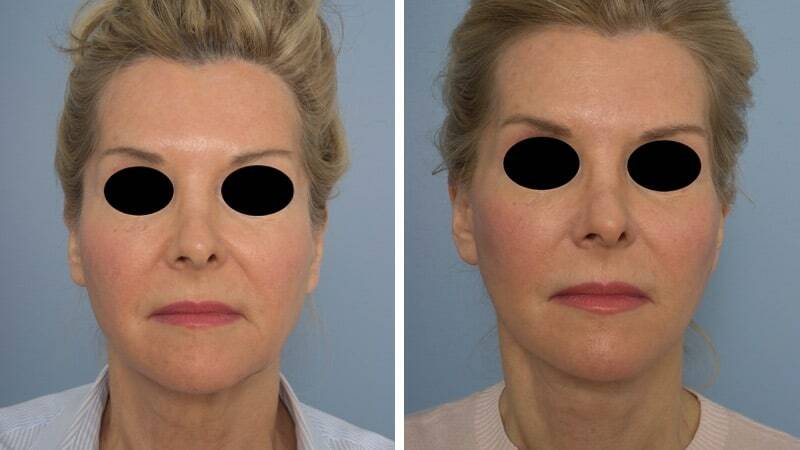 Blindness after blepharoplasty has been reported in medical literature, but it is very rare. Patients who have dry eyes may sometimes be advised not to have eyelid surgery. 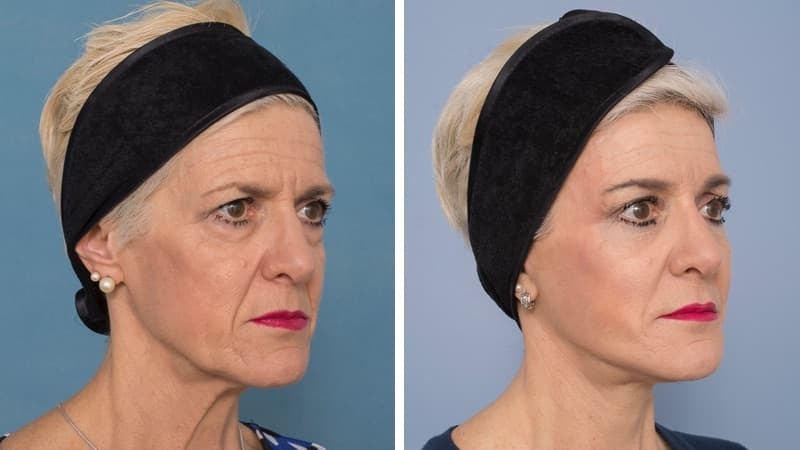 Before you commit to having this surgery it is important that you read the document “Consequences, Risks and Complications of Blepharoplasty“ which we will provide for you. 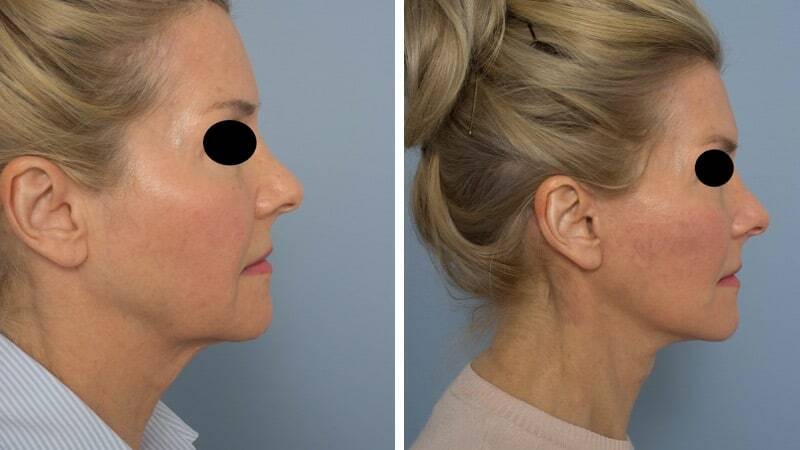 62 year old female with SMAS elevation facelift and platysmaplasty 2 months post op. 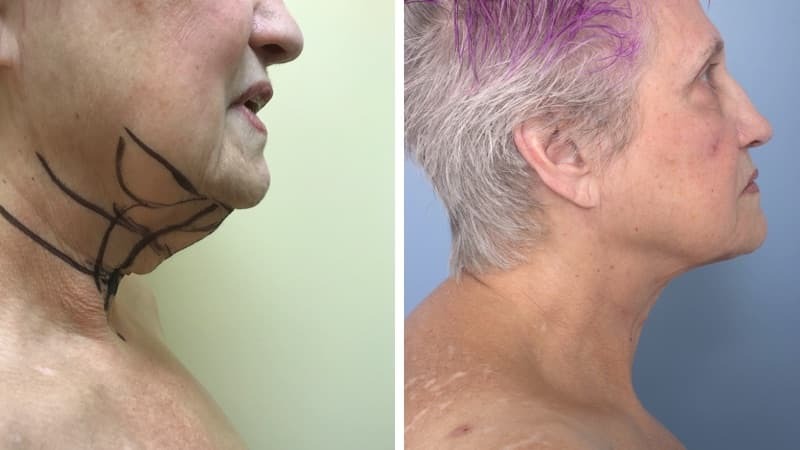 Neck correction only via submental T-Z plasty and anterior platysmaplasty. Before and 12 months after. No facelift.